Types of plasterboard and when to use them. 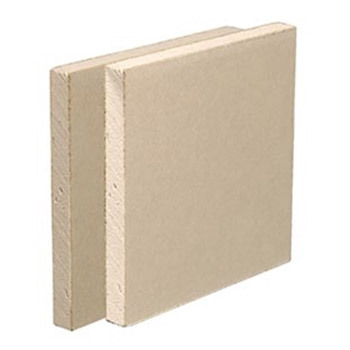 In this guide you will learn about the different types of plasterboard that are available including normal wall boards, water resistant plasterboard, fire proof plasterboard, sound reduction or acoustic plasterboard and also impact proof plasterboard. We also tell you the different sizes and thicknesses that plasterboard come in. Plasterboard, or drywall, is a remarkably versatile product consisting of gypsum plaster sandwiched between layers of thick paper. It is usually used on walls and ceilings. Plasterboard can be plastered over (see our project on skim plastering ) or painted. There are various types of plasterboard to cater for most situations found in the domestic or commercial environment. What Sizes of Plasterboard are Available? Using plasterboard as a wall finish can be much cheaper than wet plastering. 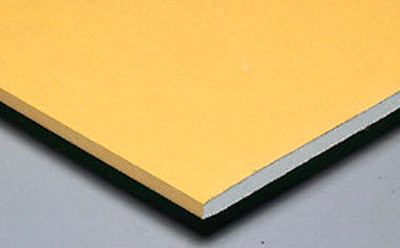 Plasterboard comes in several thicknesses including 9.5mm or 3/8 inch and 12mm or 1/2 inch. 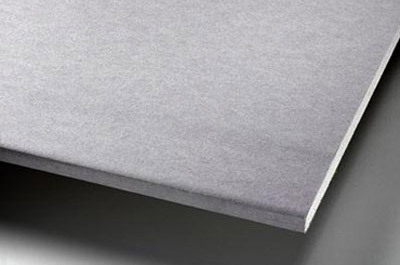 Large sheets of plasterboard are traditionally 8 ft x 4ft or 2.4m x 1.2m but smaller sheets, called plasterboard laths are available for easy transportation and ease of handling. 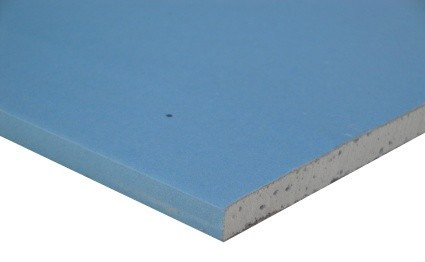 15mm and 19mm sheets of plasterboard are not uncommon for boards which have a specific task such as fire proofing or sound insulation. As well as the different makes of plasterboard for different situations, a different type of board is used when the surface is to be plastered as opposed to painted. To avoid seeing any joins in the plasterboard wall, a tapered board is used when the wall is to be painted. This means the thickness of the board is reduced very slightly as one gets towards the edge. Two thin edges are butted up to each other and some plasterboard tape is stuck over the joint. A thin layer of plasterboard joint filler is applied with a wide scraper and lightly sanded down so the surface of the filler finishes absolutely flush with the face of the board. This means the joint is not noticeable and the plasterboard tape stops the filler cracking should the wall move at all. What Different Types of Plasterboard are There? This is suitable for most applications where normal sound levels, structural properties and fire specifications are found. Normal wallboard can be fixed at a double thickness to give greater resistance with fire and sound levels. When it comes to which face of the board you can plaster or decorate onto, you must always plaster or decorate the ivory face of the board, particularly if you are plastering, as if you plaster onto the reverse of the board, it can easily fall off. The paper on the front face of the board is specifically designed and formulated to take skim plaster. In addition to this, if you are planning on papering or painting directly onto your plasterboard, you should always seal it first. This has a thin metallic film on the reverse of the sheet. This film stops warm vapours passing through the board which could lead to condensation when they passed through to a colder surface. Commonly used when dry lining a building to keep it warm and well insulated. 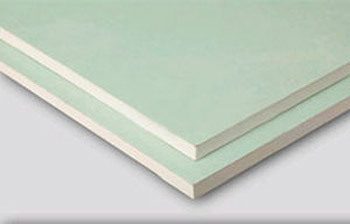 This type of board has a higher density core providing a good level of sound insulation. It is effective on thin walls and ceilings making it very useful in blocks of flats. It is most often used in conjunction with mineral wool and various sound proofing fixing methods such as resilient bars which keep the surface of the board slightly away from the surface they are on to prevent the passage of sound vibrations. See our projects on soundproofing. This board has glass fibre and other additives in the core to protect against fire in most domestic situations. 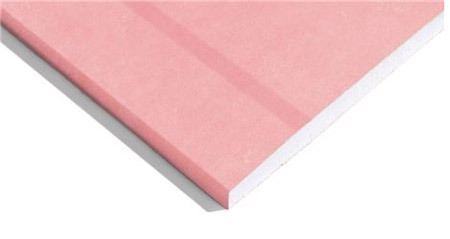 Usually fire resistant plasterboard comes with a pink face which can be painted or plastered. This type of board features water repellant additives in the core making them suitable for a base for tiling some wet areas. This type of plasterboard usually comes with a green face and is not usually plastered. They are excellent for high humidity areas but, as all gypsum plasters soak up moisture quickly, it would be counter productive to plaster them. which has a very dense core designed to resist impact and day to day knocks. 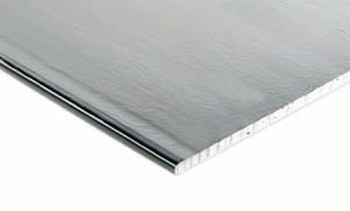 Most of the above boards are available in taper edge and vapour check and all can be used in a dry lining situation. Look at the related projects list on the right of the page where you can find other plasterboard related projects. Why not check out our video section on "cutting plasterboard" to watch a three part film on the best way to cut plasterboard.